The Atmos collection provides textile performance with everyday style and function. 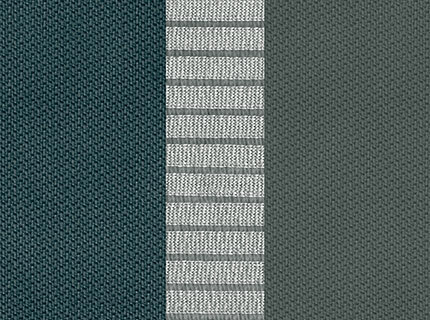 Atmos features an inky blue grey and grey durable woven fabrics combined with sporty, and safety-conscience, reflective silver accents. The 3D AirMesh knitted in a stylish silver hue provides breathable ventilation where your child needs it most. Whether out on the town or jogging the trail, Atmos offers sophistication while delivering a cool, comfortable ride for your child. Activ3 Air Jogging Stroller - Atmos is rated 5.0 out of 5 by 8. Rated 5 out of 5 by Tyler K from Great all around stroller! We have put this stroller through quite a workout the past 9 months - running, city sidewalks, snow, rain, and traveling in a car and are very pleased with the design and features. It adapts in more ways than we thought we would want and handles bumpy terrain very well thanks to large tires and an adequate suspension. Our 1 year old often falls asleep in it, so it must be pretty comfortable. There are lighter travel strollers and there are fancier running strollers, but this one does very good at both and in fact is the only stroller we use any more! Great work Chicco, we would buy another on, should anything happen to this one! Rated 5 out of 5 by Stephmom91 from Love this stroller! We bought this to go on trails at parks and Colonial Williamsburg and our 5 month old will stay asleep even over the bumpiest terrain. My daughter runs warm and the seat keeps her cool. The straps for this will hold her upright and she still needs some assistance with sitting alone. I am so glad we choose this jogging stroller! Rated 5 out of 5 by pantoneblack from Easy to use We got this stroller to replace a Britax B-agile. Let's just say the B-agile was a bit of a misnomer. The Activ3 Air Jogging Stroller is easy to adjust (recline the seat back, angle the push handle bar, lock front wheel, etc.) and comfortable for both the kiddo to ride in and for us to push (even with one hand). The folding mechanism is easy to use and the stroller rolls smoothly. Rated 5 out of 5 by RunnerMom from Excellent stroller - worth every penny! The product looks sharp but I was most concerned with it being parent-friendly and comfortable for my child. This stroller assembles with ease and Chicco has truly thought of everything. Excellent shock system - perfect for my bigger child who still rides along while I run - and it maneuvers like a dream. My son reports that it's a comfortable ride and he enjoys the sunshade that provides ample coverage on sunny days. You can lock the wheels, adjust the seatback, and fold for storage all from a standing position behind the stroller. Chicco has really created a parent-friendly product! The stroller was easy to assemble and I appreciate the foam-filled tires so I never have to worry about a flat! I have tried several other strollers and none compare to this product. The ease of assembly and steering, the thoughtful design, and the smooth ride for my child make this an excellent choice. From running on sidewalks to a packed gravel rail trail, we've enjoyed the product and it has delivered as promised. While marketed as a jogging stroller, it is also great for travel around town. Overall, I highly recommend. Rated 5 out of 5 by 3littleladies from LOVE this Jogging Stroller! Again, Chicco has outdone themselves with this high-quality jogging stroller! This jogger is super simple to assemble and looks great. The wheel lock is located right on the handle bar, no more kicking the stroller to unlock the wheels. Also, when running, the front wheel can be locked or unlocked with a flick of a switch. This stroller will be the only stroller you will need. It's easy manueverability in stores and small spaces to the ruggedness while on rougher terrain. Plenty of storage in the basket under the seat and there is a hidden pocket at the back of the canopy that is great for those items that need to be quickly accessed. My Chicco Keyfit clicks in and out with one simple click. This stroller definitely compares to my friends "Big Expensive Jogger" for almost half the price! Rated 5 out of 5 by Bessie from LOVE this stroller! Perfect jogging stroller The Activ3 is perfect for anyone with an active lifestyle. I also like the multiple recline positions and that the fabric is water resistant and reflexive at night. We haven't used all of the features yet such as the various suspensions, but are excited to know it will be easy to use regardless of pushing through grass or pavement. Our favorite feature is the easy one hand fold and the multiple folding positions. it is folds easily to fits in our car for our days at the park. Our little man has no problem sleeping while we're out jogging, which tells me he is comfortable. We couldn't be more pleased with this purchase! Rated 5 out of 5 by Joni from Amazing stroller! I am in love with this stroller! I have been using it daily since I got it. I love the sleek color combination of black and grey. My 6 month old fits very comfortably in this stroller. The straps are very easy to adjust and do not rub on her chubby little cheeks. We both love the peekaboo viewing window. It's a great way to check in without stopping. The sun shade has to be my favorite feature! It can extend so far down, that only her little feet are exposed to the sun. Even when it is fully down, she can still see out. I typically have her in the fully reclined position, but changing the seat position is so easy, it will be a nice feature when she gets older. The stroller rides very smooth, even over bumps and rough terrain. The large tires and shocks absorb the jolts from uneven pavement and sidewalks. My little one typically ends up falling asleep. Having a place to keep my keys, water and phone is great. I am in love with this stroller! I would recommend it to anyone. You do not need to be a runner, it's great for daily walks too. A must have! Rated 5 out of 5 by abc1234 from I love how this folds! I was interested in this jogging stroller for moderate distances. It is very lightweight, and maneuvers very well when turning and weaving. Also, the stroller appears to operate well in even slightly bumpy terrain for a pretty smooth ride. My 3 year-old daughter seems quite comfortable, it’s a plus that the backrest can adjust. The hands down best feature is this stroller’s ability to fold down into multiple configurations! I can fold the stroller flat to fit in the car trunk or I can fold it so it stands neatly in my garage. I’m always very happy with Chicco products—this stroller is no different. Do the Activ3 strollers lock when folded? The tires on the Activ3 stroller are rubber and are not inflatable. What is the difference between the Activ3 and Activ3 Air? The seat cover on the Activ3 Air has breathable backrest fabric with elevated airflow channels that help improve ventilation. What car seat model and color is shown in the picture? The Activ3 Air jogging stroller in the Q Collection is compatible with the KeyFit, KeyFit30 and Fit2 car seats. To view the Chicco strollers, please visit our stroller comparison chart https://www.chiccousa.com/stroller-comparison/. Does this stroller have a child tray? We do not manufacture a child's tray for the Activ3 jogging stroller. Hello! how or where can I get the full-coverage extendable canopy ? .I bough this stroller a few months ago in a toys store that was closing, but it does't have the full coverage extendable canopy. Is the model no. on the stroller? Where? This information is located on a white sticker under the hard plastic front swivel mount/child's footrest door. I already have a Graco Snugride 35 car seat (sorry..) &nbsp;Can I attach it to this stroller with some sort of adapter? Chicco strollers will not accept a car seat manufactured by another company.